If only ridding one’s self of grief after the death of a loved one were that simple. How convenient it would be if the never-ending memories, loneliness, emptiness, tears and pain could vanish by simply stepping into the rain and allowing it to wash away all that ails the griever. In reality however, overcoming grief is a complicated process, and Nemeth’s play ably illustrates those complexities. In 1978, several factory workers were killed as a result of a tragic fire at a mill in Birmingham, Alabama. The play weaves in and out of the lives of the community affected either directly or indirectly by this tragedy. At the center of this misfortune is Marlene (Kate LoConti), a twenty-five-year-old widow who has lost her husband Champ (Drew Schad) in the fire. Marlene’s rebellion against common death customs such as wearing a traditional black mourner’s dress and accepting money from the mill to compensate for her husband’s death, puts her at odds with other members of the community. Her brother and mill foreman Bo (Ken Bradley)—who has his own set of marital problems with his wife Sunny (Rebecca Jordan)—questions her decision and urges her to reconsider. So does the minister given the task of counseling the mourners (Kevin Viol), and the Greek Chorus of widows (Angie Shriner, Daria Harper and Deanna Reed-Foster), who, unlike Marlene, took the money and signed a release. “And you can feel as mighty as you want for refusing blood money. But some of us got kids,” one widow declares. The one character who remotely understands Marlene’s position is Jemison (Darren Jones), a fellow mill worker who knows that the money and memorial service for the lost workers is the mill’s attempt to cover themselves. 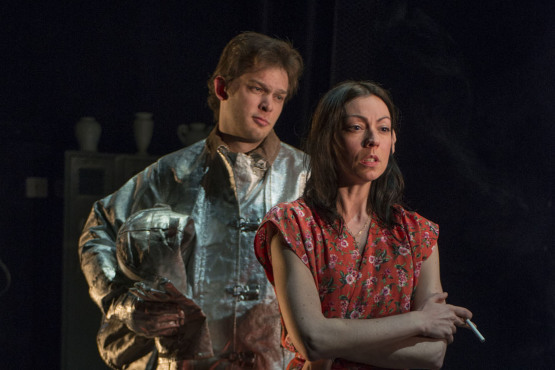 The simple set design by Jeff Bauer allows director Sandy Shinner to seamlessly intertwine time, space and memory on the intimate stage at Theater Wit. Further illuminating the story are the sound design and lighting by Christopher Kriz and Charlie Cooper, respectively. Shattered Globe Theatre at Theater Wit, 1229 West Belmont, (773)975-8150, sgtheatre.org. $18-$30. Through June 7.